New Jersey's deep and almost-pristine woods in Warren and Sussex Counties. Under the shade of oak, hickory, maple and beech, a rutted, over-grown driveway leads to a little cabin by a lake deep in the woods in Stillwater. From there, a carpet of rock and moss sprouting wild flowers and baby mountain laurel and blueberry stretches to the very edge of Fairview Lake. Native iris, trout lily, wintergreen, sedges and rushes soften the shoreline while swallows hunt for supper over the water. 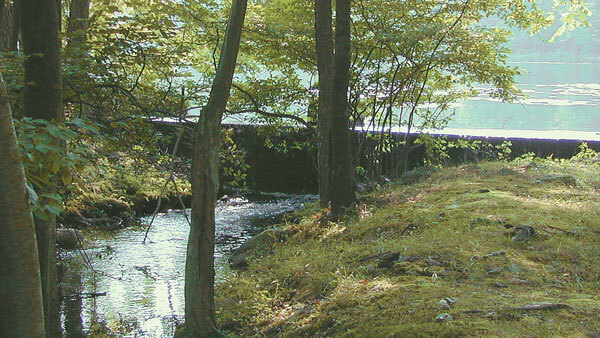 Blair Creek flows from its headwaters at Fairview Lake to the Paulinskill in Blairstown. At the spillway, Blair Creek begins its journey to the Paulins Kill. Follow the creek to the gravel road, turn left, then right, into the woods on an old grassy woods road. Yellow "No Trespassing" signs flank the path, but just ignore them. They are remnants from the time before a power-trio of land stewards bought this 480-acre tract of forest. The Nature Conservancy (TNC), The Ridge and Valley Conservancy, and the New Jersey Department of Environmental Protection purchased the land, now known as Blair Creek Preserve, from Blair Academy, Blairstown, through the Green Acres program for $1.5 million. All three organizations manage the property. Although this almost-pristine woodland is home to rare, threatened, and endangered animals like the timber rattlesnake and red-shouldered hawk and plants such as Pink Lady-slipper, its location was the impetus for preservation. Blair Creek Preserve is part of a 12,000-acre uninterrupted block of forest with no roads ­ a pure stretch of trees unmatched in the state. Together with the surrounding woods of state and national parks, the preserve provides interior habitats for wildlife, such as bobcat, bear, red fox, grey fox, and coyote, that require large tracts of land to survive. Cerulean warblers, yellow-throated warblers, and other migratory neo-tropical birds that nest only in forest interiors are visitors here. 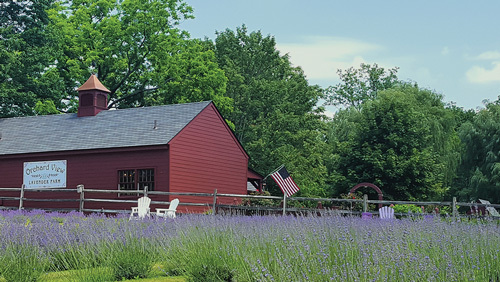 Most wooded tracts of land in New Jersey are patchy or strung together ­ "edge" ­ with little interior, where an entirely different set of species live. Back on the path, come to a "Y" and bear left. On the right is a vernal pool that dries in summer. No fish live there, but wood frogs breed so well in spring that the path gets covered with them, says Mike Van Clef, TNC director of science and stewardship. This little habitat, another indication of a healthy forest, is perfect for frogs, salamanders and toads ­ wet in the breeding season and with lots of acres for feeding. In summer, the walker may notice in the waterless pond, spreading bases of trees covered in moss and piles of thick branches growing different moss species. To the left, the land drops down to an interesting-looking wetland fed by Blair Creek. Up on the path, the woods are open and sunny with gaps in the tree canopy where patches of stiltgrass grow ­ one of the few invasive plants on this land. The effects of an abundant deer population are evident in the browse line ­ trees and shrubs clipped straight across with no foliage below a certain height. The management plan designed by the three partners to maintain forest health includes an invasive species program to eradicate the few floral pests. Much of the existing invaders can be physically removed. "The concern is making sure we bring down the deer a bit," says Tom Wells, director of TNC Skylands Program. Biologists planted seedlings and saplings on the property to measure deer herbivory. When deer ate ­ and of course removed ­ foliage, they created gaps that allowed sunlight to reach the forest floor. They found that invasive species sprouted and grew in these gaps, and native species did not. Their resulting plan is to reduce the deer population and to maintain it at a level consistent with maintaining normal forest health. 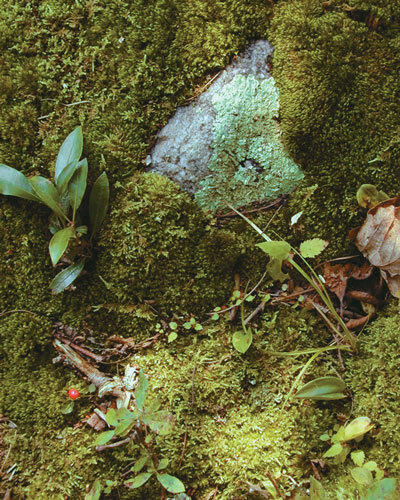 Wintergreen with moss. Moss provides the perfect growing medium for wintergreen, blueberry and mountain laurel. But there is little else that disturbs this wood. Far from crowds and suburbs, the sounds of silence and birds are all that accompany the walker. Hemlock and white pine seedlings are everywhere. Onward, a meadow opens before you. Wild flowers bloom among tall grasses. This infrequently-visited treasure of a forest path is sometimes hard to see, but walk across the meadow to the lower right-hand corner where the unmistakable grassy path slips under the trees. If it has recently rained, a small stream may cross the path or just leave puddles to jump ­ like the froggy inhabitants do ­ or skirt. Soon a worn out dirt "traffic circle" appears ­ a vestige of a "borrow pit," a small mine of some sort. Stay to the right here and everywhere, if in doubt of the correct path. Watch for the orange tape that Van Clef tied on tree boles to mark the trail. Striped wintergreen and Canada mayflower strew the ground as well as mushrooms of every shape and color in late summer. A variety of habitats abound and soon a beaver swamp appears with a view of the Kittatinny Ridge behind it. Cattail dominates the swamp. Beyond it, the trail is quite wet, fine for the adventuresome who like to pick their own way, otherwise follow the orange tape to the right onto a drier trail. Both paths meet back on the gravel road. Turn right and head downhill back to the car. Take Rt. 94 to County Route 610 (Stillwater Road). Right onto CR521. Left onto CR 617 (Fairview Lake Road). Left onto Old School House Road. Right onto Fairview Lake Lane. Bear to left at fork on dirt road. Drive 0.2 mile and park in a small gravel "lot" on the right. Walk 1/4 mile up the road and go around the sometimes-locked gate to begin a leisurely two-hour loop walk far from the crowds. Bring your waterproof hiking boots but leave your dog at home. 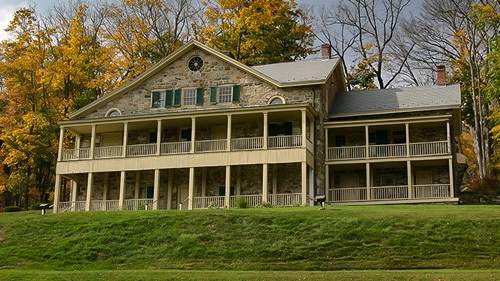 Info: The Nature Conservancy, Skylands Program office at (908) 955-0357.